I am filled with disbelief over the fact that I have been nominated for another award. And this time, I was nominated by FOUR different people! Can you believe that? Some people actually kind of sort of enjoy my blog! This is insane! Stay tuned for eleven fascinating facts about myself that you more than likely didn't care to know. 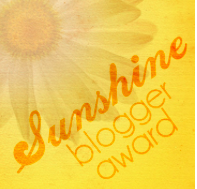 I am happy to announce that I was nominated by the amazing Bobby for the Sunshine Blogger Award. I feel so honored and honestly shocked that I would be nominated for anything!